Ask any Rolex collector or enthusiast what their favorite aspect of the brand is, and you can be sure that terms like ‘understated’ and ‘reserved’ will make up at least some of the conversation. The unobtrusive, almost minimalist design of models such as the Submariner or the Datejust have always been favored by people content with displaying only the most modest outward expression of their good taste. 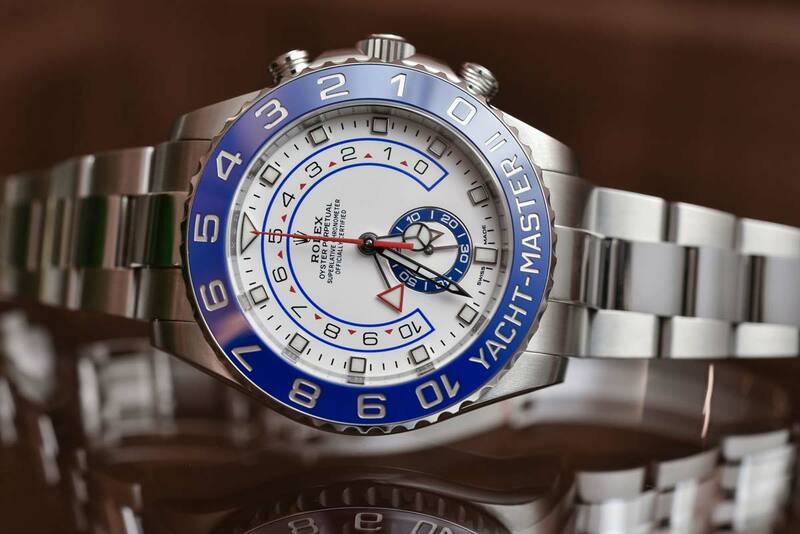 The Rolex Yachtmaster 2 is not one of those designs. The Yacht-Master II is a huge, extrovert of a watch that’s outrageous in concept and screaming for attention. It’s a massive departure for Rolex, the brand that, perhaps more than any other, exemplifies that discreetness for which the Swiss are so famous. 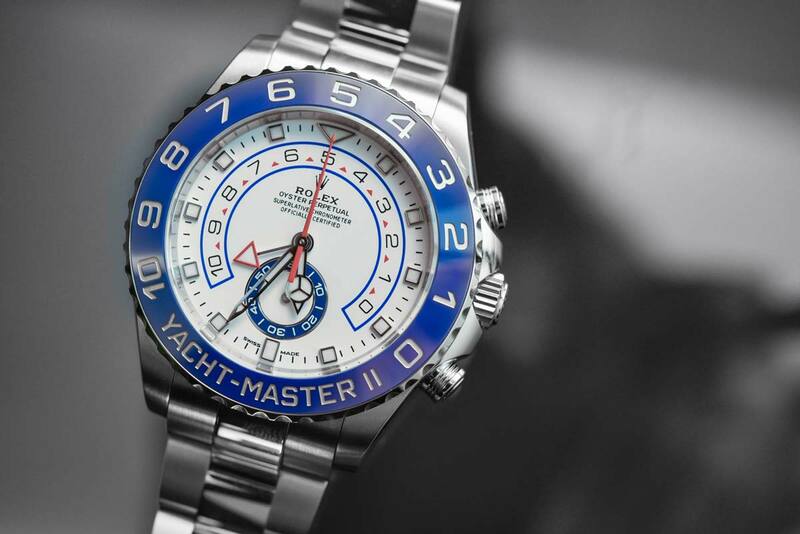 The Yacht-Master II collection has a polarized opinion since its launch in 2007. There have been subtle upgrades that marked its 10th birthday celebration, which have done nothing to quell the debate. Let’s take a look at one of Rolex’s most controversial, technically impressive, and incredibly specific offerings. Despite its title, the Yacht-Master II is a completely new model rather than an update to the original Yacht-Master ref 16622. That previous namesake, released in 1992, had very little to justify its moniker other than the standard Oyster waterproofing. There were no explicit functions aimed at making life on the ocean waves any easier. With only a few exceptions, such as the Daytona’s chronograph movement and the annual calendar on the Sky-Dweller, Rolex has rarely included complications beyond a date feature into its catalogue. So the ultra-complex programmable countdown with mechanical memory on the Yacht-Master II is all the more fascinating. The start of a regatta is a convoluted affair, generally involving several distinct phases, and having a way to precisely coordinate the timing of each stage is vital. With the wind being what it is, yachts can’t just sit at the start line of a race waiting for the off. Skippers have to maneuver their boats back and forth without crossing the line for a specified length of time before the race begins, usually between five and 10 minutes. 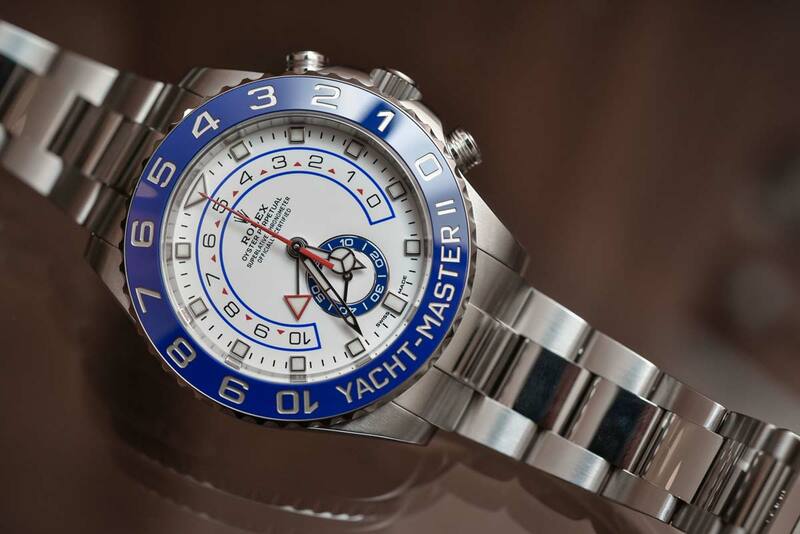 The perfect watch for yachting, especially if you partake in events such as the Rolex Fastnet. The start of this countdown is signaled by a gunshot and is followed by two further preparatory signals at set intervals to allow crews to coordinate their approach. Cross the start line too early and they’ll incur a penalty, too late and they risk bringing up the rear for the rest of the proceedings. This was the multifaceted problem facing Rolex. 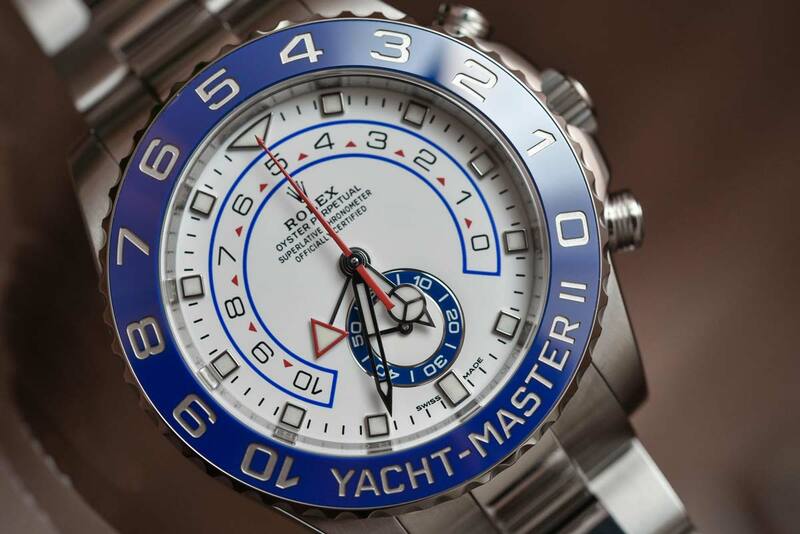 It wasn’t enough for the Rolex Yachtmaster 2 just to be able to measure intervals of time. Because of the nature of a regatta’s starting procedure and the split-second timing involved, skippers need to be able to synchronize their watches with the race’s official countdown timer ‘on-the-fly’. To achieve all this while still keeping the watch manageable in both size and operation has taken some brilliant ingenuity. The key to this timepiece is the bezel, which is now directly connected to the movement and has become intrinsically linked to the functionality. Known as the Ring Command Bezel, rotating it through 90° unlocks the programming operations of the watch. Turning the crown sets the countdown duration, and returning the bezel to its start position locks and memorizes the setting. The countdown is started by pressing the top pusher, with the elapsed seconds indicated by the sweep hand on the center dial and the minutes by the red arrow hand on the internal horseshoe-shaped gauge. Should you need to adjust the watch’s countdown at any time, if you started it too early or late, for example, simply pressing the lower pusher causes the seconds hand to reset—to ‘fly back’ to its starting position. The red arrow hand also synchronizes to the nearest minute to compensate for any discrepancy. The power behind all this technical virtuosity is Rolex’s own, in-house self-winding movement, the Caliber 4161. Based on the 4130 from the Daytona, the two share several important features, such as the blue Parachrom hairspring in the oscillator that offers up to 10 times more shock resistance than traditional movements, plus a 72-hour power reserve. Even with the 4130 as a base, the Yacht-Master II’s movement still took Rolex around 35,000 hours to perfect and is built up of over 360 separate components. Accurate to within two seconds a day, like all Rolex Perpetual Movements, it surpasses the Swiss Official Chronometer Testing Institute (COSC) tests for precision and reliability and carries Rolex’s own Superlative Chronometer certification. 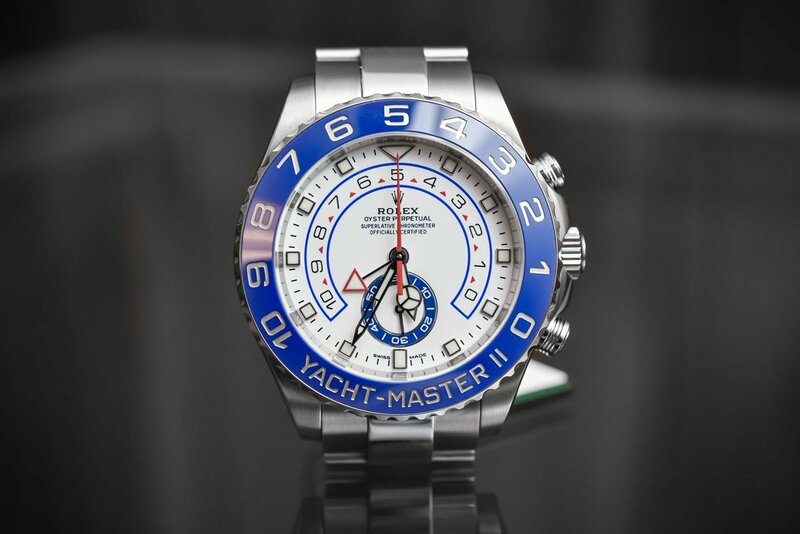 Perhaps the only subtle thing about the Rolex Yachtmaster 2 is the facelift it enjoyed on its 10th anniversary this year. All the delicate upgrades were confined to the dial, with the inner workings being left well alone. The 12 and 6 markers were changed from the squares shared by the rest of the indices to a triangle and rectangle respectively. To further aid legibility, the hands were also updated—where the previous model had thin batons, the hour hand is now the iconic Mercedes figure, with a luminescent disk. The minute hand, while still baton shaped, now has a cutout section to avoid obscuring the regatta countdown. The new dial is carried over onto all four of the Yacht-Master II’s models—the 904L steel, the Everose Rolesor, the yellow gold, and the white gold and platinum. Each finish carries the same reference number as the 2007 originals. Rolex launched multiple watches at Baselworld 2017, but the Yacht-Master II certainly splits opinions like the Sea-Dweller. It won’t be found on the wrist of the shy and retiring. But is your average professional sailor or yacht owner someone who generally likes to blend into the background? With its extravagant color scheme and imposing physical size—at 44mm, it’s the biggest reference in the Rolex lineup—there’s no danger of anyone mistaking it for anything else. But whether it’s your thing or not, it remains a brilliant example of the watchmaker’s art.